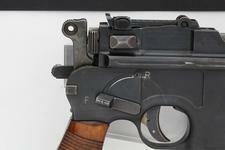 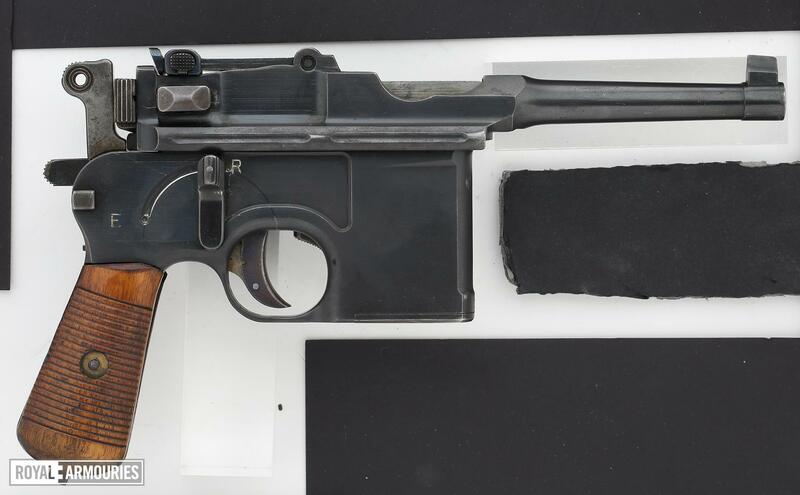 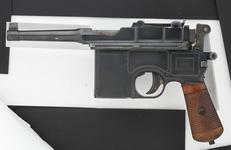 10-shot experimental Mauser C96 pistol with experimental fully automatic mechanism, built on a 'Bolo' size frame and barrel, with standard rear sight marked 50-1000. Typical period features including small ring-shaped hammer, deeply milled panels in frame, later firing pin retainer, NS type safety catch, integral trigger unit, short extractor, and 'Waffenfabrik Mauser' nock's form marking. 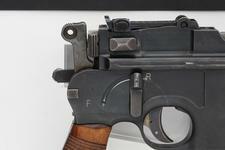 With matching wooden holster-stock furnished with leather strap. Typical rust-blued finish on frame and barrel/barrel extension, extractor, rear sight and trigger fire blued, internal parts and the hammer case-hardened. 22-groove walnut grips. No proof marks. Mechanism is a rare early form based upon Fidel Fedeerle's original patent (submitted June 17 1921) for a selective-fire pistol, but with the addition of a pivoting selector switch on the right hand side (i.e. 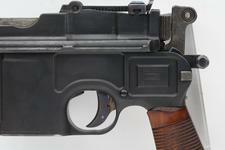 opposite to production Schnellfeuers).